Michael Earp is a bookseller and the editor of Kindred: 12 Queer #LoveOzYAStories. He has passionately worked with Children’s and YA books for more than 16 years. He has a degree in Early Childhood Education and a Masters in Children’s Literature. His writing has appeared in The Victorian Writer and Aurealis. He also established the #AusQueerYA tumblr to coincide with the #LoveOzYA campaign, of which he was previously the Committee Chair. Michael will be reading at First Chapters on Friday 5 April from his short story "Meet and Greet" which is published in Underdog: #LoveOzYA Short Stories. ‘Meet and Greet’ is a queer meet-cute for book nerds set at Melbourne Writers Festival. It’s pretty adorable and very wholesome. Matt Davies is an author of YA fiction. He has been a full-time writer for 10 years and has ghostwritten seven non-fiction titles and written scripts for TV commercials and documentaries. Matt sat on the board of Australia’s Emerging Writers’ Festival for 5 years, including 2 years as Chair. Matt will be reading at First Chapters on Friday 5 April from his debut novel This Thing Of Darkness. I’ve chosen a section midway through the novel when Riley wakes up at her old house after a harrowing night.It’s a pivotal moment for my character and gives the reader a sense of the tone of the book. I write contemporary young adult novels set in Melbourne. They lean on the literary side and I try to pack an emotional punch. Jes Layton is a geek with a hat, who writes about, draws, and discusses queer-nerdy things. Born on Gulidjan land, now living on Wurundjeri, Jes is the Administration Officer for the UNESCO Melbourne City of Literature Office and the Administration and Marketing Coordinator for Express Media. Jes was an Oustanding LGBTQIA+ Short Stories Award recipient in 2018. 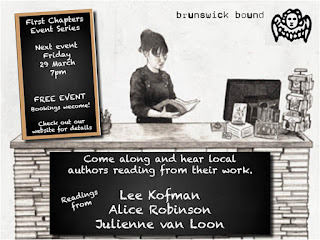 Jes will be reading at First Chapters on Friday 5 April from her short story Chemical Expressions which will be featured in Underdog #LOVEOzYA Short Stories. At the end of last year we wrapped many a book for Brunswickian Christmases. We had great fun doing it and are so grateful to everyone who donated, by way of thanks, to Movimento Letras. Movimento Letras is an independent literary movement, founded in Dili, that promotes literacy and provides spaces for people to connect and share stories. "Movimento Letras is an independent literary movement founded in 2017 by a small group of Timorese activists, whose aim is to create a vibrant literary culture in Dili, Timor-Leste. We have a small library and weekly we occupy a public garden that is open to anyone who wishes to participate. In the library there are many books and materials that are not available elsewhere through public and private institutions, all of which have been donated. The space is also used for workshops including zine making, teen and adult reading clubs plus presentations and guest talks.